Happy New Year, my friends! Welcome to an all new year here in my Cocina! We've got a new look (I hope you like it!) and lots of exciting things planned for La Cocina throughout the year. But first I want to welcome you to what I hope will be a new & improved version of the Food of the Month Club! I've made a few changes in the hopes that it will make things easier for all of us. First change is that we are going back to posting the announcement at the beginning of the month. Having the month go from the 15th to the 15th was just too confusing, and for that I apologize. The second change is instead of doing a round-up each month and having you email your entry to me, you can just come back to the announcement post and add your links to a Linky tool located at the bottom of each announcement post. That way we have the announcement and all of the entries in one place and we no longer have to wait until the end of the month to find out who participated and what they made. Again, I apologize for any confusion. And thank you for being so patient while we work out the kinks. And now on to this month's theme...Soup! Because the weather outside is absolutely frightful and because there's really nothing quite as delightful as a big bowl of soup on a cold winter day. Every kind of soup imaginable is welcome! Broths, chowders, stews & chilis are also welcome! 1.) 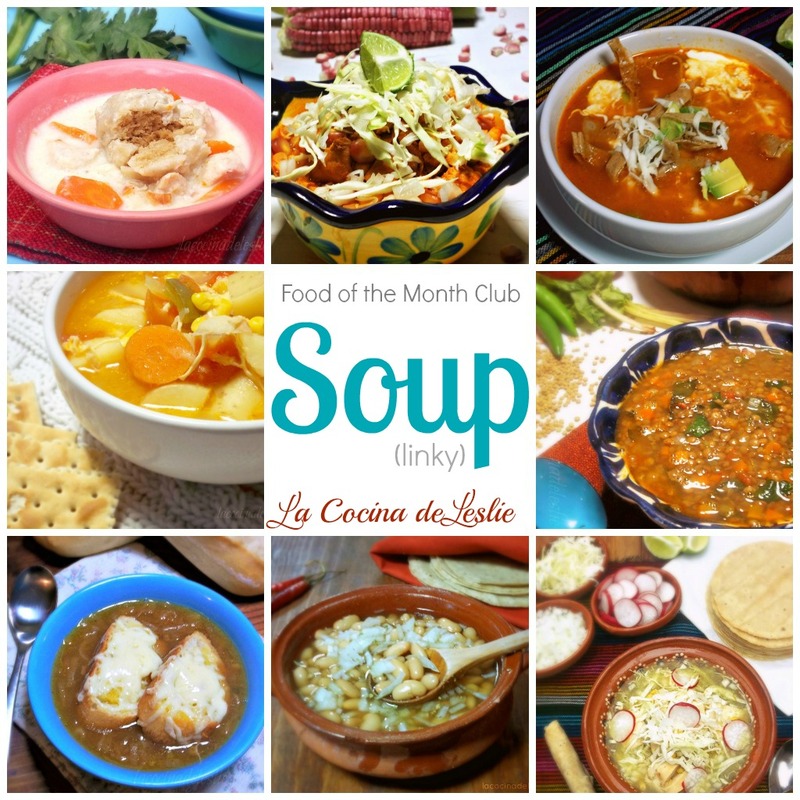 Visit La Cocina de Leslie at the beginning of each month to find out the Food of the Month Club theme or ingredient. 2.) Cook up something delicious according to the Food of the Month theme or using the Food of the Month as a main ingredient. 4.) Come back to this announcement post and add your link(s) to the Linky Tool widget located at the bottom of this post. Then leave a comment so we don't miss out on your dish. 5.) Show some love to the other entries by visiting and commenting on their posts and maybe make a new foodie friend in the process. 6.) Have fun! And share about The Food of the Month Club with your friends. *The Linky Tool will be open until 11:59PM (EST) on January 31st. Oh good, I like the linky idea...makes it much easier, indeed. And SOUP - yay! This sounds like FUN!!! I'm in! I'm going to have so much fun this year! LOL! I am so excited to find this blog--I was looking for a recipe for camarones al mojo de ajo, and who knew it was so easy! I hope to participate in this month's theme--and testing out many of these recipes--yippeee! Just added a link for my Quick Chinese Chicken & Rice soup! Great way to use up leftover chicken and rice. I've just linked up my green lentil and coriander (cilantro) soup. Leslie, unfortunately, the month got away from me with welcoming my new baby boy so I did not get a chance to make my soup - but did still want to share! My fave Mexican soup is Puchero - a hearty beef soup with a ton of veggies in it. The meat is tender and great in corn tortillas on the side. And I also love the small cut sections of corn on the cob...learning to eat more with my fingers was a skill I learned in Mexico ha ha All the entries above look delish! Happy cooking!